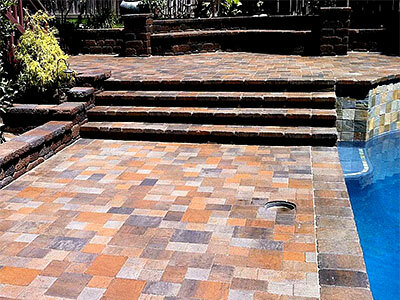 We at LR Landscaping & Pavers provide a variety of landscaping and paver installation services to customers in and around Sacramento, Auburn, Roseville and Folsom. Over the years, we have also catered to large number of clients in and around Citrus Heights, Rancho Cordova and Rocklin. Our company has also successfully completed projects in Lincoln, Fair Oaks, Yuba City and the surrounding areas. Many of our customers have questions related to landscaping and outdoor living areas. Q. Are pavers strong enough to bear vehicular traffic? A. Yes, high-quality concrete pavers are very strong and resilient and can withstand regular foot and vehicular traffic and can be used in driveway applications. Q. What are retaining walls built of and are they different from boundary walls? A. Retaining walls are specially-engineered features made of concrete masonry units. These walls are different from boundary walls in that they are specifically built to provide support to the landscape and sloping areas in your landscape. They also help prevent soil erosion and can be built as multi-use features with built-in planters and seating spaces. Q. Can I build an outdoor kitchen on an existing patio space? A. Outdoor kitchens are a value-add to your property and they look great in any area of your home. Many of our clients request for an outdoor kitchen to be built on their patio or deck areas and these become the perfect extension to the indoor spaces of your home. Q. Will a pergola provide sufficient protection from the rain and sun? A. A pergola is essentially a grid of battens that are supported on four posts and can be installed in any area of your yard. While it does provide a certain amount of shade, it won’t provide complete protection from the sun and rain. But you have the option to add either a retractable roof or shade sails to the feature for additional shade. Q. Which areas of my landscape can I install pavers in? A. Pavers are extremely versatile products and they can be installed on patios, walkways, driveways, decks, pathways, courtyards, entranceways as well as poolscapes. Q. Can you design and install a pool deck for my yard? A. Yes, we can design and build any type of landscape feature based on your specific requirements. We can design and install paved deck spaces and can provide ideas and plans to add various other amenities such as fire features, BBQ grills, lounge chairs and outdoor umbrellas etc. Q. Where in my landscape can sitting walls be useful? A. A sitting wall performs a dual purpose- it provides support to the landscape, helps prevent soil erosion from excavated slope areas and provides extra outdoor seating as well. These are low-height walls with flat tops that can be used as a seating surface. These walls can be built along outdoor kitchen spaces, your patio, around a fireplace or fire pit area or just about anywhere in your landscape where you need this dual functionality.